College hockey's biggest rivalry takes center stage tonight as #9 BU begins a home-and-home series with top-ranked BC. Tonight's home game at Agganis and tomorrow night's game at Conte Forum, both 7:30 starts, will air nationally on NBC Sports Network with Doc Emrick handling play-by-play. Terriers will look to build on last week's shutout of St. Lawrence and gain ground on the Eagles in the Hockey East standings. 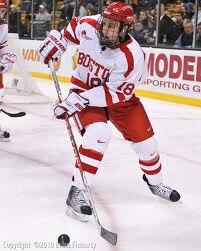 Three weekends ago, BC topped BU, 4-2, with defensemen Matt Grzelcyk and Alexx Privitera netting goals. With BC Coach Jerry York two wins away from becoming the all-time NCAA leader, the Terriers also will be out to delay that milestone and end BC's 10 game winning streak. ► The online BU recordbook has been updated. Click here and then choose "Scoring and Goaltending Records"
Terriers return to conference action with a home and home series against Providence, visiting Schneider Arena for a 7 p.m. start tonight and then hosting PC at Walter Brown Arena tomorrow at 3 p.m. Two weeks ago, BU delivered a convincing 7-1 win over the Friars led by co-captains Jennell Kohanchuck and Marie-Philip Poulin who each scored a pair of goals. The Battle of Commonwealth Avenue resumes this weekend with BU hosting the top-ranked Eagles at Agganis Arena Friday night and visiting Conte Forum Saturday night. Both games will air nationally on NBC Sports Network, beginning at 7:30 pm, with Hall of Fame announcer Doc Emrick handling play-by-play. 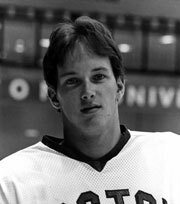 Episode 8 of Inside BU Hockey features Bernie Corbett’s interviews with Coach Jack Parker, senior center Ben Rosen and former Olympic gold medal winner, co-captain of the 1978 national championship team and BU Hall of Famer Jack O’Callahan (photo). Former BU blueliner David Warsofsky talked with The Patriot Ledger about the challenges of balancing offense and defense with the AHL Providence Bruins. Terriers take on conference-leading Providence in a home-and-home with an opportunity to overtake the Friars. BU won the first matchup of the season, 7-1. Sean Maguire’s 4-0 shutout of St. Lawrence earned him Hockey East’s Pro Ambition Rookie of the Week award. Garrett Noonan, with an assist, two blocked shots and a +3 for the evening, made the top performers’ list. The Daily Free Press looks at the strong efforts of BU’s 3rd and 4th lines that kept the Saints’ top scorers in check. Former All-American and Hockey East MVP John Curry has been signed to a PTO by the AHL Houston Aeros. Curry, who began the season with ECHL Orlando and rang up a 2.82 GAA in 14 games, will join another ex-Terrier, Charlie Coyle, playing his first pro season with Houston. Coyle, with a 7-4-11 line in 18 games, talked about his transition to the AHL with XM Radio. With NHL lockout dragging on, former BU captain and St. Louis Blues' d-man Kevin Shattenkirk has signed with TPS Turku in Finland’s SM-liiga. Terriers played their final exhibition game of the season tonight, defeating the Russian National Team, 6-1. BU goal scorers were Jennelle Kohanchuk, Kathryn Miller, Kaleigh Fratikin, Kayla Tutino, Rebecca Russo and Jordan Juron. Senior Alissa Fromkin stopped 15 of 16 goals. Over The Boards reports that BU has received a commitment from St. Sebastian's senior wing Tommy Kelley. Chris Heisenberg's recruiting site indicates he'll arrive either in 2013 or 2014. In 2011-12, the 6-0 187 lb. forward from Natick, Mass., was second in scoring for the Arrows with a 19-15-34 line in 28 games, trailing only current Terrier freshman Danny O'Regan. 2013 recruit Dalton MacAfee, a 6-0, 180, blueliner, also is a St. Seb's senior. In last Spring's NEPSIHA Martin/Earl division semifinal, Kelley's hattrick--his third of the season--led the Arrows past Kent, 6-3. He scored a goal in the division championship game, which St. Seb's lost to Berkshire, 4-3 in OT. Kelley and MacAfee also were teammates this fall on the Cape Cod Whalers U18s in the Mass. Midget Selects League, coached by former Terrier and NHLer Ed Ronan.